Blandford Forum had a "House of Industry" at the end of East Street dating back to at least 1761. A parliamentary report of 1777 recorded parish workhouses in operation in Blandford Forum for up to 50 inmates, and at Tarrant Gunvil for up to five. The Poor are mostly relieved in a Workhouse, which is in a good situation, and tolerably neat and convenient. There are 22 beds of feathers, flock and chaff in 3 rooms, Since Easter, 1794, the Poor have been under the direction of the parish officers, but previously they were generally farmed for 2s. 6d. a head weekly. There is no regular master or mistress, but two paupers have the care of the Workhouse, in the absence of the overseers. There are at present 36 inmates, 13 children, 6 men, and the rest mostly old Women. Those who are able to work, and are not engaged in the business of the house, are employed in button making. 108 regular pensioners (most with families) have weekly allowances. Several others have occasional relief. The table of diet is as follows : Breakfast—Broth made with flour, onions, water, etc. Dinner—Sunday, Wednesday—Meat and vegetables; other days—Bread and cheese. Supper—Bread and cheese. Each grown person is allowed on Sundays and Wednesdays, ¾ lb. of bread. and other days, 1 lb. Two pints of beer are allowed daily. The weekly allowance of cheese is 1½ lb., or ½ lb. cheese and ¼ lb. butter. Children have a smaller allowance. The rapid rise of the Poor's Rates in this parish is generally attributed to the high price of provisions, the smallness of wages, and the consolidation of small farms, and the consequent depopulation of villages, which obliges small farmers to turn labourers or servants, who seeing no opening towards advancement, spend their wages as they receive them, without provision for old age, and if incapacitated by a short illness, fall on the parish. Many of these notions appear to be false, but the prevailing opinions of a countryside are worth noticing. It is said that there are now only 2 farms in Durweston, about 3 miles from here, which contained about 30 small farms 20 years ago. And what is more singular the town of Abbey Milton, which was formerly the central market of the county, is now a fish pond. There are several charities in the parish, under the direction of the corporation, and said to be wretchedly managed. County of Dorset: Almer, Anderson, Blandford Forum (3), Blandford St Mary, Bryanston, Charlton Marshall, Durweston, Hilton, Iwerne Courtnay alias Shroton, Langton Long Blandford, Milbourne St Andrew, Milbourne Styleham, Milton Abbas, Pimperne, Spettisbury, Steepleton Preston, Tarrant Crawford, Tarrant Gunville, Tarrant Hinton, Tarrant Keynston, Tarrant Launceston, Tarrant Monkton, Tarrant Rawston, Tarrant Rushton, Turnworth, Winterborne Clenston, Winterborne Houghton, Winterborne Kingston, Winterborne Stickland, Winterborne Tomson, Winterborne Whitchurch, Winterborne Zelston. Later Addition: Chettle (from 1894), Farnham (from 1894). The population falling within the union at the 1831 census had been 13,056 with parishes ranging from Steepleton Preston (population 36) to Blandford Forum itself (3,109). The average annual poor-rate expenditure for the period 1833-5 had been £8,387 or 12s.10d. per head of the population. The new Blandford union took over the old parish workhouse and enlarged it to accommodate 250 inmates. In October 1836, the Clerk was ordered to "write to the Guardians of Wimborne Union and request the Guardians to forward one of their mortars used for pounding bones for the inspection of the Board." The following month, the Master and Matron complained that there were insufficient able-bodied women in the workhouse to perform the household work. The Relieving Officers of the various parishes were ordered to "look over their Out-Relief lists" with a view to sending more able-bodied women into the workhouse. A new union workhouse was erected in 1856-7 on a site to the west of the Salisbury Road in Blandford. The old building was then sold off for £1,200. The new workhouse, designed by Christopher C Creeke, comprised an entrance block, a T-shaped main block, and some small ancillary buildings. The site location and layout are shown on the 1929 map below, by which time the workhouse was officially known as Blandford Poor Law Institution. 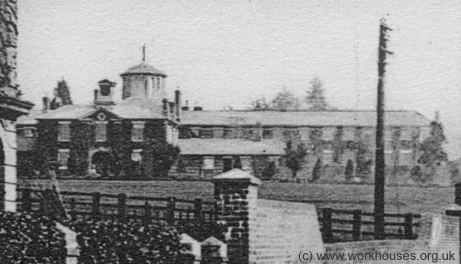 Blandford workhouse from the south, early 1900s. 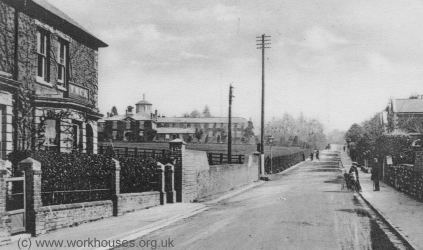 Most of the new workhouse building was demolished in the early 1970s, although the entrance block survives. The site is now used as a residential care centre. Dorset History Centre, Bridport Road, Dorchester DT1 1RP. Holdings include: Register of inmates (1761-5, 1793, 1805); Guardians' minutes (1835-1930); etc.